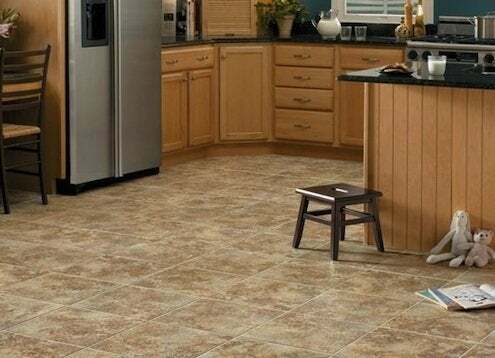 Vinyl tile and laminate flooring is attractive, durable, and long-lasting, even under a home’s highest-traffic conditions, but the product is certainly not indestructible. Fortunately, cleaning vinyl flooring is a fairly straightforward and inexpensive process, and with proper care, it’s easy to maintain the material’s eye-catching appearance. One of the best cleansers for vinyl flooring is apple cider vinegar. The acidity in the vinegar helps remove dirt and grime without leaving a buildup of soap or wax. Simply mix one cup of cider vinegar with a gallon of hot water and use a damp mop to clean, rinsing the mop frequently with hot water. Substitute white vinegar for cider vinegar if you want to disinfect as you clean. 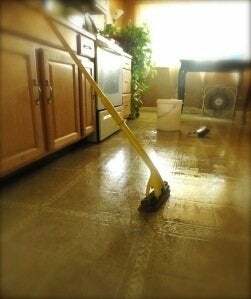 If your floor is especially dirty, try adding a few drops of liquid dishwashing soap to the mixture before mopping once with the soap mixture, a second time with vinegar and water. To add shine to your vinyl floor, add a few drops of baby oil to the vinegar and water solution. For food stains from grape juice, mustard, ketchup, tomato sauce and the like, make a paste of baking soda and water and gently rub the stain until it disappears. Clean thoroughly to remove any traces of baking soda. A soft, nylon-bristle brush can help remove many types of stains, especially when used with common household solvents. Rubbing alcohol can be used to remove lipstick, hair dye, and ink stains. Use mineral spirits to remove crayon, paint, and marker stains. Use a nail polish remover that contains acetone to remove nail polish stains. Some commercial cleaners are specially designed for vinyl floors. These include Pine-Sol Multi-Surface Cleaner; Pledge Tile & Vinyl Floor Cleaner and Pledge Tile & Vinyl Floor Finish with Future Shine; and Armstrong’s Once ‘n Done Resilient and Ceramic No-Rinse Floor Cleaner and Armstrong Shinekeeper Polish. The first step is to try minimizing dirt, stains, and abrasions before they occur. Over time, dirt and dust can wear down and degrade the finish on any type of flooring, including vinyl tile or laminate; therefore it is always a good idea to situate a good-quality doormat or area rug in front of doorways so that grit and grime don’t migrate into the house. Another helpful hint is to use a sheet of plywood or paneling any time you need to move furniture across the floor; this will help prevent scuff marks or tears in the vinyl. You also may want to use vinyl coasters under the feet and legs of your furniture to safeguard against permanent indentations. Do not use ammonia or ammonia-based cleaning solutions on vinyl flooring; these can break down the material and cause cracks in the flooring. With just a little time and elbow grease, vinyl flooring can take years of use and abuse and still look lovely.